Tax reform is ugly business in Washington. Few bills stir up either side of the aisle as much as discussion on tax policy – especially when the federal deficit is in the trillions annually. New corporate tax reform bills circulating through Washington are targeting dividend recapitalization and debt financing strategies often used by private equity investors to lower tax bills and boost investor profits. So are we watching smart policy unfold in Washington, or just more politics as usual? What’s a Dividend Recap, anyway? A dividend recapitalization is just one of the many ways to take equity out of a business. Traditionally, private equity funds use dividend recapitalizations to displace their own equity with debt. By financing the needs of a business with debt, the new owners (a private equity firm) can pay themselves dividends from accrued earnings on corporate balance sheets. Quick returns – Private equity investors typically purchase firms with leverage, using only a fraction of their own money in a deal. A dividend recapitalization allows a private equity company to buy a company with leverage, and then use leverage to remove their original investment. Additional risk – A dividend recapitalization adds risk to a business purchased by private equity investors. The debt incurred through a dividend recap is to be repaid by the business, not the private equity firm. Meanwhile, cash is usually bled from the company to pay dividends to the owner. The combination of increased debt plus reduced cash does leverage any business substantially, making it especially vulnerable in the case of a downturn. Moral hazard – Suffice it to say that private equity investors do enjoy the benefits of moral hazard. Using other people’s money to make investments allows management to enjoy the upside of any given investment with limited downside risk, as invested capital is owned by investors in the private equity fund, or the bank making the loan to buyout a company. Common target: cratering businesses – By virtue of tax law, dividend recaps are most often employed in older businesses that may already be in the midst of a downward spiral. Take Research in Motion, for example, a company which is losing market share to competitors from every angle (and which was recently highlighted in a pairs trade here at DarwinsMoney). Wall Street values the mobile technology company at $6.85 billion, an amount less than the $7 billion of retained earnings on the balance sheet. Theoretically, investors could pay themselves a dividend of up to $7 billion provided RIMM had the cash to pay the dividend. Where could RIMM find the money to make the deal? Debt financing, of course! It’s important to note that not all dividend recaps are part of a buyout, even if most are a cog in the wheel of a corporate takeover. In 2007, Domino’s Pizza paid a $13.5 dividend to investors against a per-share price for the stock of only $33. The company financed its dividend with borrowed money, and repositioned itself so that it was partially financed by both equity contributed by investors, and debt owned by bondholders and bankers. You can still find a Domino’s Pizza on most every street corner, and its recapitalization plan hardly affected the firm’s operations. Recapitalization is usually an excellent deal for shareholders and bondholders alike. In the case of Domino’s, shareholders displaced their interest in lower-yielding assets with low interest debt. Dividends paid to shareholders could then be reinvested in other, better-performing opportunities. Meanwhile, debt holders had the opportunity to purchase debt securities in a successful business. Stockholders seeking higher returns get some of their capital back as cash to invest in new opportunities. Bondholders and debt financiers get a safe return from a debt-based investment. Both parties win, and the company lives on. In many ways, a dividend recapitalization plan is no different from a home mortgage refinance. Ben Bernanke himself recently refinanced his own home at a fixed rate for 30-years. Suffice it to say that Bernanke’s $180,000 salary and million-dollar net worth could be used to pay off his own $850,000 home quite quickly. However, paying off his mortgage at a low rate apparently made less sense to the Fed chairman than financing his home and using capital in other, higher-yielding opportunities. Bernanke created his own kind of dividend recap, pushing off the complete repayment of his mortgage loan to reduce his own home equity for other uses. Average Americans do the same virtually every day of the week – who wouldn’t, with rates so low? A move to ban dividend recaps is all politics in the purest form. However, a reduction in the amount of interest corporations can deduct from their taxes is much more “noble,” if you could ever apply that name to a revenue grab. A limit on the amount of interest deductible by a corporation increases any company’s tax burden, since one of the biggest benefits to debt financing is that interest is written off as an expense. Banning dividend recaps as a practice is a way to slap silly the parties who use them the most – private equity teams. 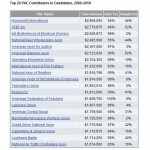 Interestingly, studies show Democrats receive more from private equity donors than Republicans. There’s no long-run advantage to slowing private equity’s earnings for the President. However, keeping dividend recaps in the news in combination with corporate tax rates and Romney’s tiny tax rate does make for a very powerful marketing tool for any populist in 2012. It’s all fun and games in D.C. – business as usual.